Sitting in a room full of keen looking people, ipads and pens poised, whilst feeling sleepy and listening to a fit looking woman talking about running across the USA. On trails. Surely I’m having a nightmare, or am I sat in the wrong room? What am I doing here?! Well even a few years ago I would have been in the wrong place. This weekend though I was sat, in the correct room, at the Write This Run conference at the Running Show. Despite an early start I was being inspired and terrified in equal measures by the speakers that Laura and Liz, the organisers, had lined up. It would take waaaay too long to write about all of the speakers, and they do deserve mentions because they were all fascinating in their own way. However I’ll just mention the people I found especially interesting and inspiring. The first session was entitled ‘Be Inspired’, and started with Jen Bradley talking about running across the USA, on trails, in the summer of 2012. 80 days of continuous running averaging 42 miles a day. Imagine considering a day when you ‘only’ run 31 miles to be a rest day, and you’ll get an idea of the scale of the journey. After a casual remark to a friend started the whole adventure, Jen’s first words of advice were “be careful who your friends are”. Her method of ensuring the success of the project? Having no contingency plans. Still reeling in admiration after Jen’s tales, we next heard Sophie Walker talk about how and why she started running. She was used to having a stressful and dangerous job working as a journalist for Reuters, however nothing was as scary as the day her daughter, Grace, was diagnosed as being Autistic. Running helped her find the strength and drive to get the help that Grace needed. She started blogging about her running, and about life with Grace, and both found it immensely helpful. As Sophie said, “running and writing saved us”. It was lovely to see that Grace had come with her Mum to the conference, even if like a typical pre-teen she sat at the back with her headphones in! Simon Webb followed, talking about being a blind runner, and how he’d researched the route of the LondonMarathon in order to find out the stories and histories of the places the race goes through to give him something to think about whilst running it. His best tip on beating boredom whilst running was to find an interesting person to run with. After all, he joked, there’s no ‘loneliness of the long distance runner’ for him – he always has someone with him! His book wil be published soon. After a tea break the conference continued with a session entitled ‘Blogger-Brand Relationships’. As a relatively new blogger, and one who is still struggling to write a decent race report, I didn’t really expect to hear much of any relevance to me. Surprisingly though I still learnt a few useful tips that I will be implementing into the blog soon. Who knows, maybe I will be at the stage of talking to brands one day! If I am, I shall be taking careful note of what Muireann Cary-Campbell as I was seriously impressed with how someone so glamorous could actually be a keen runner and highly successful blogger as well. Lunch break gave me a chance to stroll around the stalls at the running show and eye up the bargains. With a house extension under way any expense has to weighed up against ‘house-y’ stuff. Jacket vs. Door handles. Running tights vs. utility room sink. Sigh. I returned to my seat slightly depressed from my window shopping, but excited because next up was the session I was really interested in – ‘Better Blogging’. I sat and waited to hear the secret of ‘how to write a badass race report’ from Jody Raynsford and to find out all about Mr Twit and the classroom wasp, from Jonny Muir. First thing I learnt from Jody was that my current style of race reporting is bad, rather than badass. Fortunately he also gave us lots of ideas on how to improve. Read my next race report to see if I manage to add colour rather than description. Thanks to Jonny I know now to ‘look for the nugget’, and that ‘people care about people’. I also know who Mr Twit was. The final session of the day was entitled ‘Run Strong’ and was focussed on injury, recovery and utter madness. Robbie Britton currently runs for Team GB and is ranked 17th in the world for Ultra Marathon running. Robbie was relaxed, laid back, very funny and seriously bonkers. 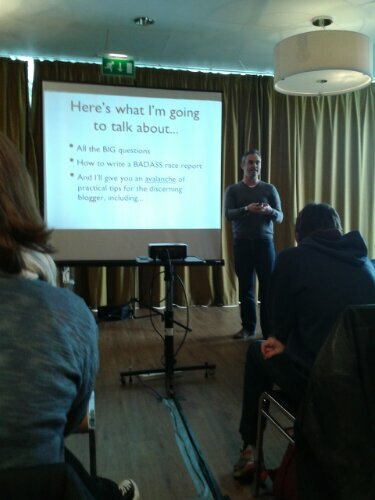 This was a dangerous talk to listen to, because it made me think “This ultra running stuff sounds easy – I could have a go!”. However as the talk was actually entitled “Suffering is all part of the fun” I guess that’s a good warning that its maybe quite as easy as Robbie made it sound. A cold, misty, drizzly, Autumn Sunday morning – what better than to get up early for a race? A 10K race (a distance I’ve not run for a few months) with the chance to meet up with some online friends from Runner’s World. It was one of those complicated mornings – daughter staying in London for the weekend, husband already out cycling in Somerset, and son to be dropped off at grandparents. I hadn’t registered for the race, but the instructions said you could sign up on the day by 10.45, with the race starting at 11. 10 o’clock saw me throwing my son out of the car at my parents’ house (because we were already running a bit late), belatedly followed by me sneaking in to use their loo (race day morning – I don’t need to say any more). Then a quick read of the directions to the race HQ and I was off again. Although the race is called ‘Swindon 10K’ its actually in Wroughton – a few miles south of Swindon, at the edge of a disused airfield. I always feel anxious heading off to new places, and instructions like “don’t use a sat nav because our postcode will take you to the wrong side of the airfield” don’t help. Driving through North Wiltshire following the directions all was going well until the HQ (a large ex-aircraft hangar) came into sight – just beyond a large queue of cars waiting to park. As I crawled forward I was trying not to clock watch as I knew time was tight. At a quarter to eleven, I was still queuing to park and desperately trying not to imagine being told I was too late to register. I was finally directed to a lumpy bit of grass to park on, grabbed my pre-filled form and cheque and sprinted inside the hangar. Fortunately I was still allowed to register, and holding onto my race number I shot back outside to find the loos. Between queuing for a portaloo and walking to the start I’d managed to meet up with all of my online friends. We all agreed that far from being a small race like we’d expected, there were over 500 runners and it was busy. One friend, Yvonne, said she was hoping to beat 55 minutes, which was my target as well, so we lined up together. 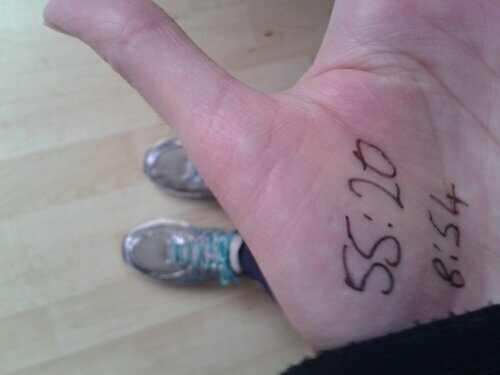 Before I’d left that morning I’d scrawled my last 10K PB time and pace onto my hand so I could keep an eye on it as I ran. The man with the megaphone summoned us all to the start, explained how we had to complete a short turn round the car park, then two laps of a bigger loop (turning left at the end of loop 1, and right at the end of loop 2 to head for the finish line), then a sprint for the finish. These race instructions always sound complicated but I always have plenty of runners to follow so I don’t worry about it. The race wasn’t chip timed, so although we didn’t hear a starting whistle, air horn or even someone shouting “GO!” we just started shuffling forward when everyone else did, and started our Garmins as we crossed the line. The first little loop was quite narrrow, and we found ourseves running slower than the pace on my hand. With some “excuse me!”s and some wriggling we found ourselves some space to run. Running the main loop for the first time it was discouraging to see a “3K” marker, swiftly followed by a “7K” marker, and knowing we had all this to run again. My friend was running strongly, and it was only at this point that she told me that although she wanted a sub 55 time, in her recent half marathons (4 in 4 weeks!) she’d been passing the 10K point at around 53 minutes. Our pace was around 8:30 minutes per mile (and faster) and I was starting to wonder if I could keep that pace up. I took my mind off it by looking around me. Part of the route was a fairly busy road, with cars trying to overtake us whilst dodging vehicles coming the other way. Not quite the quiet country lanes we’d been promised. We turned off from this road after a kilometre or two and then we were on smaller lanes. Much more peaceful, but the misty drizzle meant it was hard to take in any views. I bet its isolated up there in the midst of Winter! The 5K mark had a water station, and much like in the Devizes Half this was in a muddy farmyard, but the water was still very welcome. At this point I realised we were running at faster than my 5K PB pace, and I was starting to feel a stitch after glugging some cold water. I told Yvonne to push on ahead as I had to slow down a little. I watched as she pulled ahead but tried to make sure I kept my pace up. At the end of the first loop we approached a large sign telling us to turn left for the second loop. This time around passing the “3K” marker I felt smug as the “7K” marker was the important one here. Off the busier road again and onto the narrow lane I could tell there was a very slight incline this time. My legs were feeling heavy and I was paying for my fast start. A few runners passed me at this point which is always disheartening, but I also passed a some runners which made me feel better. The kilometres passed quickly and soon I reached the 9K mark, by the water station. “Time to turn it up!” I thought. Sadly, my legs were pretending they couldn’t hear me and carried on at the same pace. I could see the final turn in the course ahead leading onto the last hundred metres or so to the finish, and I did manage a short sprint finish. Well, it felt like a sprint finish to me – I expect it didn’t look like one (other than in a ‘bionic woman slo-mo” style). I was so greatful to cross the line I almost missed collecting my medal, which would have been a shame as its a great medal. I caught up with Yvonne at the end. I’d been abale to see her all the way around but couldn’t catch her. She was pleased with a new PB, and I checked my watch to discover I also had my new PB – of 54:02. If I’d known I was so close to sub-54 I’d have persuaded my legs to find an extra 3 seconds! I finally met up with the rest of my friends to find the two other PB hunters were happy as well, including my friend Mel who managed his first ever sub-60 10K. Whoo ho! He beat the 10K PB he’s had for a few years since we last ran a 10K together and he beat me on the final straight. Often at races I’ve not even finished when they have the prize presentations. The once or twice I have been, not many people have hung around. Fair enough when you’re getting cold and wet at the end of a race. 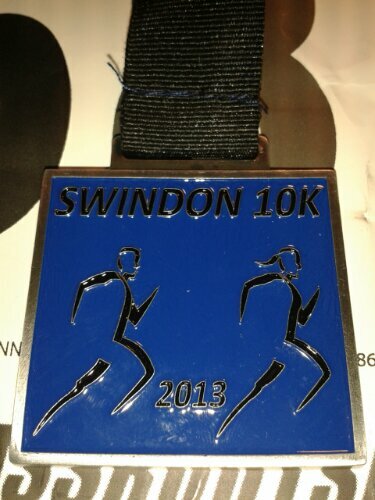 At the Swindon 10k they had a great way to ensure as many people as possible stayed for the prize giving. They had two vouchers for running shoes from a local running shop and they chose the winners by a draw of race numbers. If they pulled your number and you weren’t there, you missed out. It was exciting, but sadly neither I nor my friends won anything. However as they presented the age-related prizes, Mel realised that he only needs to stick to his current pace for another 9 years and he could win the over 70’s prize! I decided it was time to run up and down some hills in the woods. Well it was Thursday and it wasn’t raining. Amazingly it wasn’t a mudfest, it was stunningly beautiful with the trees just beginning to change colour and the first sun for days. 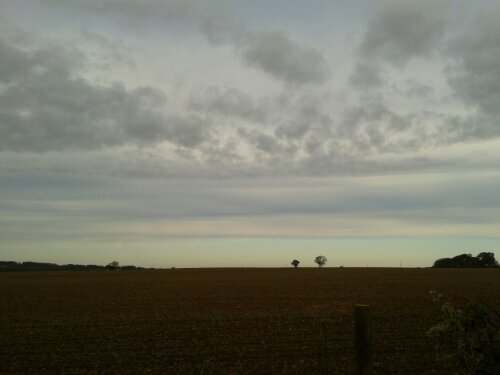 As I ran down the little lane to the woods, the sky was huge with awesome clouds. I wish I’d had a decent camera with me, but my phone did its best to capture it. 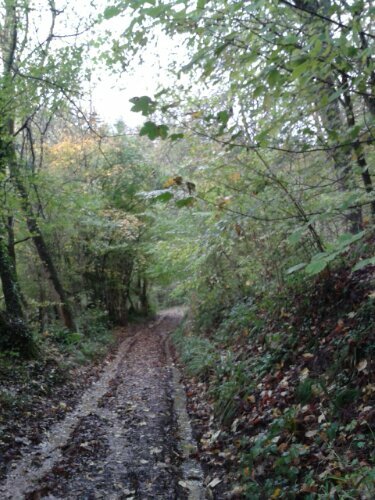 The path through the woods was wet and slippy, but very quiet with just my puffing and panting disturbing the peace. 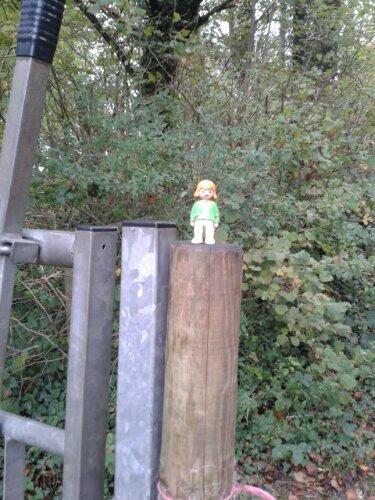 I did find a little lost soul in the woods, so if anyone’s looking for them, they’re stood on a gatepost waiting for you. The best bit about runs like this is looking at the stats afterwards. Not pace, that’s always frighteningly slow, but the elevation profile. In our house, Saturday mornings are for having a well earned lie-in. Or even a not-earned-at-all lie-in. On Friday though, our builders had informed us that they would be arriving to pour concrete at 7.30am. On Saturday morning. sigh. Seeing as I was going to be up anyway, and seeing as a combination of builders and children had restricted my running this week, I decided it was time to dip my toe in the Parkrun water. 8:15am found me driving along the motorway to Swindon. My closest Parkruns are both around 30 minutes drive away (another reason I’ve not been before) and I wanted to be there in good time to park, find where the start was and, most importantly, find a toilet (a pre-race essential). 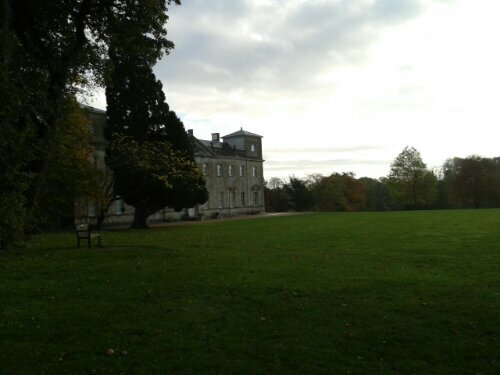 It’s a few years since I’ve been to Lydiard Park and I wasn’t sure I could remember where everything was. I found my way easily and parked closest to the cafe. I was reassured to see other runners getting out of their cars – at least I’d have people to follow! I asked a man, who was with his daughter, if he knew where we had to go (and if there were any toilets). He said he’d only run Swindon once before, a year ago, but they were on holiday so thought they’d come along. I’d met my first Parkrun tourists! I locked up the car and followed them past the cafe (where he helpfully pointed out the toilets). I then walked on down the path and found people in Parkrun hi-viz jackets putting up a gazebo. I set off for a little warmup ‘jogette’ and explore. I soon found Lydiard House – and quite stunning it was too, with the sun behind the clouds and the leaves starting to turn orange. As I got back to the gazebo, a few more runners had gathered and more were appearing down the paths all the time. There were youngsters, parents with running buggies, runners of all ages, shapes and sizes. There were also lots of four-legged runners, excited looking dogs attached to their owners’ waists by ‘hands-free’ leads. As I stood waiting, my carpark friend reappeared, pointed out where the start was, and described the route to me. He also helpfully pointed out the fact that the finish wasn’t at the start, but was just over the startline around a corner. Important info when timing your sprint finish! When I told him I was hoping for a time of 25 minutes he said he’d seen a 25 minute pacer and to look out for a tall chap in an orange hi-viz best with ’25’ on the back. More runners gathered, and then we were being addressed by a lady with a megaphone who asked for ‘absolute silence’. As I commented to a man stood next to me, the dogs obviously hadn’t heard the bit about ‘silence’, as they were doing a great impression of the Hounds of the Baskervilles. I think they knew what was coming and were keen to be off. She said to be careful because the path was wet and to keep off the grass. She asked if there was anybody who was at their first Swindon Parkrun. I sheepishly put my hand up, received a round of applause, and a whisper in my ear from my neighbour that that meant I had to buy the teas at the end. Next thing the hooter sounded, the dogs howled and we were off. I had been warned that the paths were narrow without much room for overtaking, and I learnt that was no exaggeration. For the first half mile I found myself jogging along at a very sedate pace. I could see a pacer in front of me with a large ’35’ on his back. I decided I had to move up through the pack of runners so employed a combination of skipping through gaps between runners and blatant overtaking by running on the grass at the side of the path until I could see the ’30’ pacer. He was running at about 8:30 minutes per mile pace so I carried on running at his speed. The route heads away from Lydiard House, along paths around the surrounding fields. Two laps of a triangular course mean you can see runners both ahead and behind you for most of the way around. It is a pretty route, and every junction had a smiling marshal indicating the way. By the second lap I was feeling the run in my legs, so it was amusing and amazing to see how the dogs were trotting along quite easily, enjoying every step. I didn’t envy the dog owner who had to stop when their little dog wanted to investigate a small stream, nor the owner who was having to run whilst carrying a (full) dog poo bag. As we came along the final straight I was glad I’d been told that the finish was not at the start (which we could see ahead of us), but was a sharp left turn and a short way ahead. I crossed the line, was handed my finishers token and walked round to the gazebo to be scanned. I chatted with other runners again as I rummaged in my pocket for my barcode. It is a simple system that obviously works well to record your time and position. I drove home fairly happy with my time of 27:39. I hadn’t beaten my PB of 26:46 but after my slow start I hadn’t expected to. 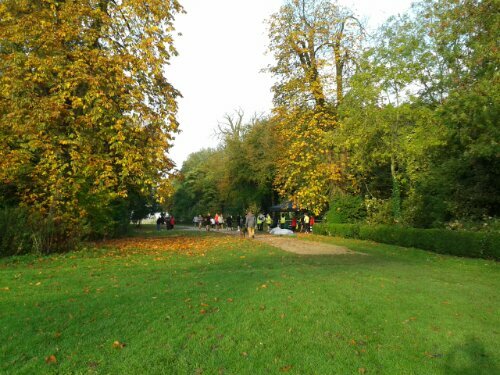 However I had made it to my first ever Parkrun and really enjoyed it. 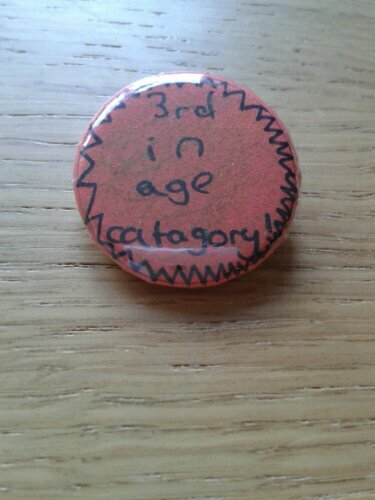 My daughter made me this badge. I wore it. I loved getting a text later on that day with my official time, and when I followed the link to the Parkrun results page I was amazed to see I’d finished 138th out of 288 runners, I was the 28th female finisher, and for my age category I’d finished third!